I’m always looking for fun ways to make life for more interesting and, in many cases, to make people think! One way that I like to spark conversation is through my clothing – I tend to have an eclectic sense of fashion and I know what I wear often starts conversations! Because I also like to make people think, I was really pleased when I was given the opportunity to review one of their breast cancer t-shirts! While I am lucky that I am not a breast cancer survivor, this cause is very near and dear to my heart. I have had three amazing women in my life who have battled, and beat, breast cancer. I have watched them struggle to deal with their treatments and how this disease has impacted their lives. Having the chance to review a shirt that would help raise awareness of this disease had me stoked! 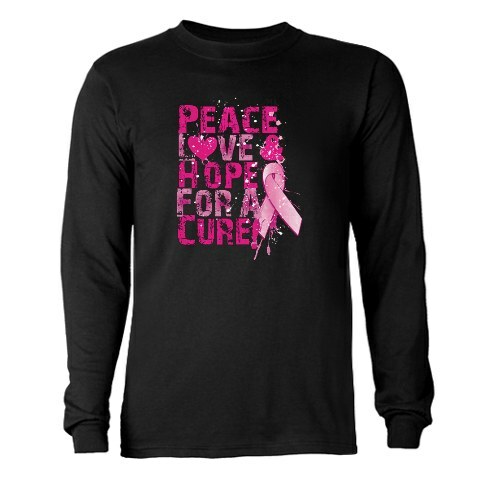 I chose to review the “Peace Love and Hope for a Cure” long-sleeved tshirt. When the shirt arrived, I was impressed by the fact that there were specific washing instructions included with the shirt to ensure I would know how to best care for it. I thought the design looked great – I loved the contrast of the colour on the black shirt. When wearing it, I’ve received an amazing amount of compliments about the shirt and it has opened up dialogues with various people about breast cancer – it never ceases to amaze me how many people have been touched by this disease! While I chose this shirt, there are many great breast cancer t-shirts and pink ribbon bags! 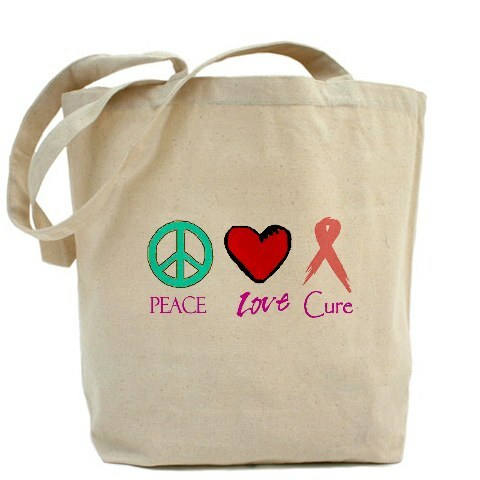 I really like the “Peace Love Cure” totebag. It is so cute! Also, check out the “Believe” tshirt – isn’t it pretty? CafePress will be donating 10% of all proceeds to Breastcancer.org to support the cause for all items purchased from the Breast Cancer Shop – they include breast cancer t-shirts and pink ribbon bags! This entry was posted in clothing, Review and tagged awareness, breast cancer, Cafepress, health, shop. Bookmark the permalink. Breast cancer has played a big role in my family. I love these products. Great find! CafePress has awesome stuff. I like that they are supporting Breast Cancer Awareness with some really cool items. Thanks for sharing. I like the Believe t-shirt too! I love pink and what a great way to support breast cancer. I love love love that shirt! It looks awesome and is for a great cause. Plus, black is my favorite color. Definitely going to go check them out! I love the shirts! So cute! I love companies that step it up and promote charitable causes! Oh I’m a huge supporter as my mom is in her 4th year of being breast cancer free. I need to head on over and check out their stuff! I also like the “Believe” tshirt! 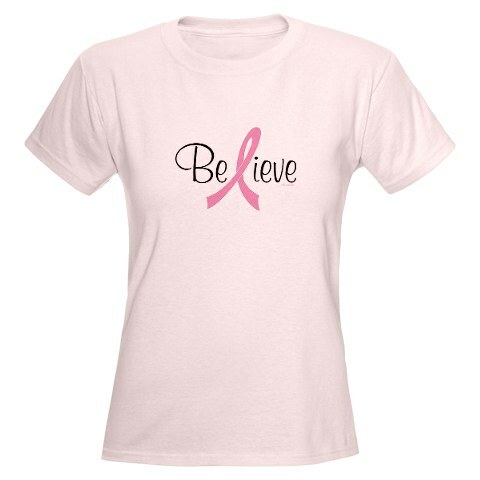 It’s a sure way to help others (breast cancer awareness and Cafepress!